It's pink, and it's lacy, but so far that's all I know. 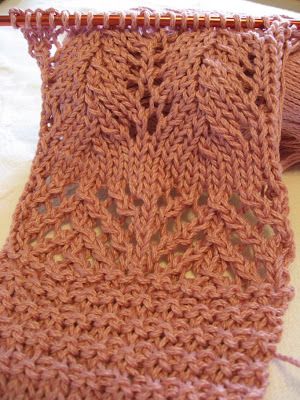 Here's a swatch with a few stitch patterns, but no clear favorite. I bought this cotton yarn (Reynolds Saucy) a year ago after I learned to crochet. My intention was to make a lacy jacket thing. 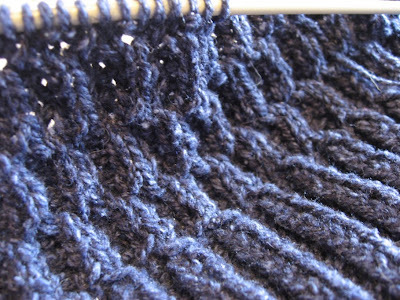 But, then I learned to knit. I haven't really crocheted since. This is the beginning of the Honeycomb vest. It's pretty. The cable twist is kind of a pain in the gluteus maximus, though. 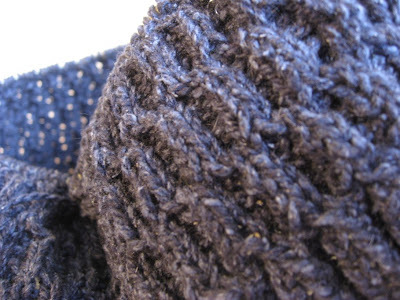 The yarn (Elsebeth Lavold Silky Wool) is thin and much darker than in these pictures. I'm having a hard time seeing the stitches. I'm getting used to it. And, since it's not for me, I can congratulate myself on what a self-sacrificing martyr I am when the irritation starts building. It kind of looks like Ziggy is genuflecting to me in this pic. That'll be the day. He's playing on the bed. Like Oprah, he prefers fresh sheets daily, or at least every other day (I heard her say that on her show once). Clean bedding makes him frisky (don't know what effect they have on Oprah). 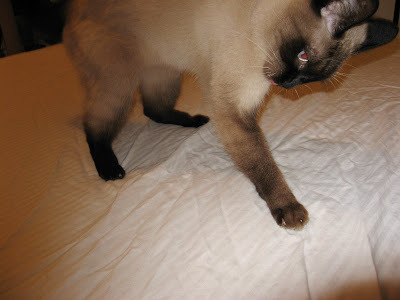 As soon as the sheets hit the mattress, he starts prancing around, arching his back, hissing and acting tough. He does not deign to frolic on unclean sheets. He thinks they're...unclean.